I’ve been trying to declutter my house and organize it better in an effort to bring a little more order to my world. Just read my post on less stuff, more happiness to get a better idea of my thought process. I’ve been grouping the clutter into piles – some will get tossed, some re-purposed into new things (like these denim coasters or mittens), some donated, and some sold. Since my husband’s cousin graciously invited me to join her garage sale (she lives in a great spot in town), I’ve been working even harder on getting stuff ready to go out the door. The biggest challenge with getting rid of stuff this way, is how to price items for a garage sale. 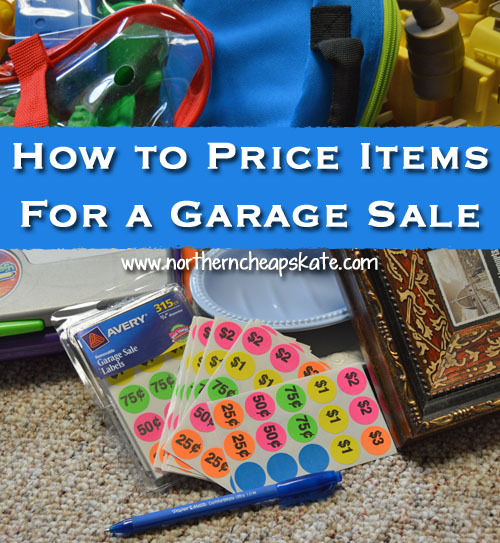 A lot of my knowledge comes from the book Garage Sale Success Secrets, with tips on how to best price items, and other important necessities for maximizing the cash you make on each garage sale event you have. For $10 bucks it might eat into the profits on your first garage sale, but I have to say it helped me make at least an additional $25+ from each garage sale that I’ve had since. What is my motivation for selling this? If the goal is to make money, then I will try to get top dollar for whatever I’m selling. You’ll make some fast cash this way, but you also risk having items go unsold if garage sale shoppers think your prices are too high. If the goal is to declutter, then I will price things to move. I may not make as much money as I could from the items, but I will get rid of a ton of stuff as bargain hunters scoop up my stuff at the sale. If the goal is to make money and declutter, I will price things somewhat in the middle. I’ll make a decent amount of money, and I’ll probably have a few leftovers I couldn’t sell at the sale that I will be okay donating later. Once I’ve figured out my motivation for selling things at the garage sale, I can start pricing them accordingly. A good rule of thumb for how to price items for a garage sale is to charge 10 to 25% of the original price paid. This will help you move a lot of stuff since people love a bargain. The condition of your item can affect the price. Items that are in like-new condition can bring in a little bit more money – especially quality children’s clothing and baby gear. Items that aren’t in working order or are missing parts should be marked dirt cheap. A note on the item saying whether the item works or not can go a long way in selling it. Know what the going rates are in your neighborhood. Visit other garage sales in your area to see what they charge for garage sale items. If you’re still not sure what to charge for an item, take a quick look at eBay to get a feel for what similar items are going for. People don’t attend garage sales planning to spend more than $25 or $30, so if you have items you want to sell for more, you may want to find a different place to sell them like a consignment shop or Craigslist. Mark everything with a price. It’s much better for both buyer and seller to have prices clearly marked. That way you won’t accidentally sell something you didn’t intend to sell. Or if you’re selling things at a sale hosted by more than one family, someone else doesn’t tell the buyer the wrong price for an item. Bundle like items. It can get a little tiresome putting a price tag on everything, so make your life simpler by grouping like items together. You could also consider a blanket price for certain items – like all books for $.50 or all kids clothing for $1. Just make sure you have good signs detailing the prices for those items. Be willing to negotiate. People love a good deal, and a lot of folks will try to get an even better price by haggling with you. If you’re serious about selling something, be willing to negotiate on price. If you’ve priced your items a little high to begin with, it is easy to come down a little to make a sale. Have a “free” box. If your goal is to declutter, placing a well-marked box with a “Free” sign on it will help some items move out of your life. Consider a sale at your sale. If your garage sale spans more than one day, and you really want to sell it quickly, then consider selling everything for 50% off toward the end of the sale. 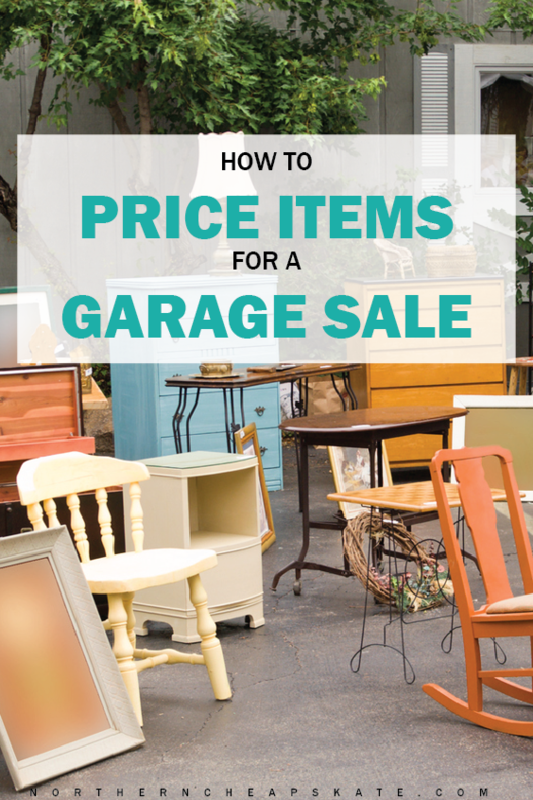 Once you know your motivation for having the sale and these simple tips for how to price items for a garage sale, it’s easy to get the job done. And if you do get stuck on what to charge, abandon all of your ideas about how much money you’ve sunk into the item and look at it as a complete stranger would look at it. When you know what you would pay for the item, you’ve got your price. I helped a friend with a sale this spring and the goal was to have as much stuff gone as possible. An hour before we were supposed to be done, everything was half price. About 30 minutes before the advertised closing time we broke out the grocery bags and let people fill them for 2 bucks. Sure, some people got bags with what would have been 15 or 20 dollars worth of stuff at 8 am BUT! We only have 4 boxes of things left at the end. We cleared out a double garage and driveway full of stuff.